Well, we are on day three (the last day) of our sneak peek foray from REVERSE CONFETTI, and today will be no different in sharing another new stamp set to love and a coordinating Confetti Cuts die set. 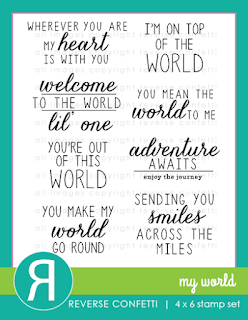 This last stamp set the Confetti Crew is debuting is called MY WORLD, and there's a super cute Confetti Cuts die set that coordinates perfectly called simply GLOBE. I decided to do something a little bit different and made a pocket card to hold a tag. 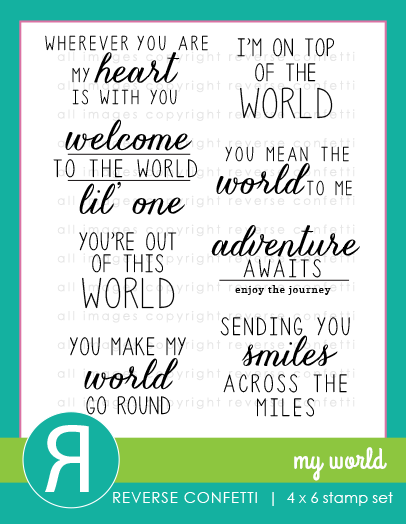 The GLOBE Confetti Cuts makes a great focal point for the outside of the pocket, while the tag carries the sentiment from the MY WORLD stamp set. I can totally tell I'm going to have lots of fun with this GLOBE die and sentiment set! They are so on trend! SUSIE Q-TIP: It was discovered by another Confetti Crew member that the large circle from the DONUT YOU KNOW set fits perfectly with the globe stand, so that if you wanted to make a solid circle globe there instead of the cutout heart piece, it works great! Love this card with the great tag. What a fun design! Love the tag! Aw, this is just WAY too cute! Love your card a lot, nice colors too. Great that different pieces from other releases can be used with the new releases. Love the pocket card. Haven't made any of those but I'm going to put that on my "to do" list. What a gorgeous card, so detailed. Love all the layering in your card. 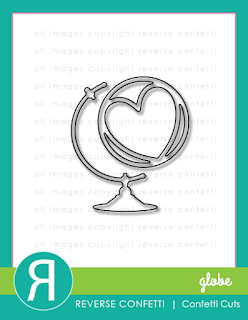 What a cool and unique way to use the globe die. Super cute card. I like the layers and the stars. Great choice of warm colours for a warm sentiment! Wow! Love what you've done!